Have Retirement. Will Travel. : Campground Cat Crisis! and their new protector, Linda. It happens. Campgrounds have cats and cats have kittens. Kittens grow quickly and reproduce. Homeless pets are multiplying and that's a problem. 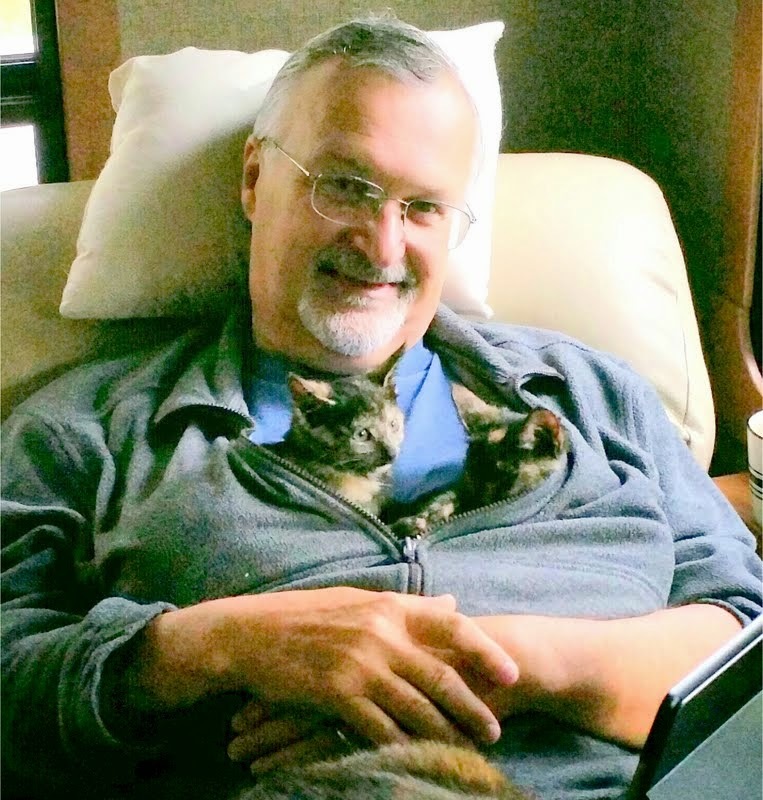 I am a cat lover and I have lots of cat loving friends and we found ourselves in the midst of a campground cat crisis in the early days of last winter. Meet Tammi (red jacket) and Linda (pink jacket). Tammi works at Seminole Campground where we've spent the past three winters. Linda is my crazy cat lady friend and co-camper at Seminole Campground. Linda is just as obsessive over cats as I am over dogs. We compliment one another quite well. To make a long story a little shorter... one of the campground's ferrel-like cats (really one that was dumped here a few years ago) had a litter of kittens. Originally there were four kittens but something has already happened to one of them. 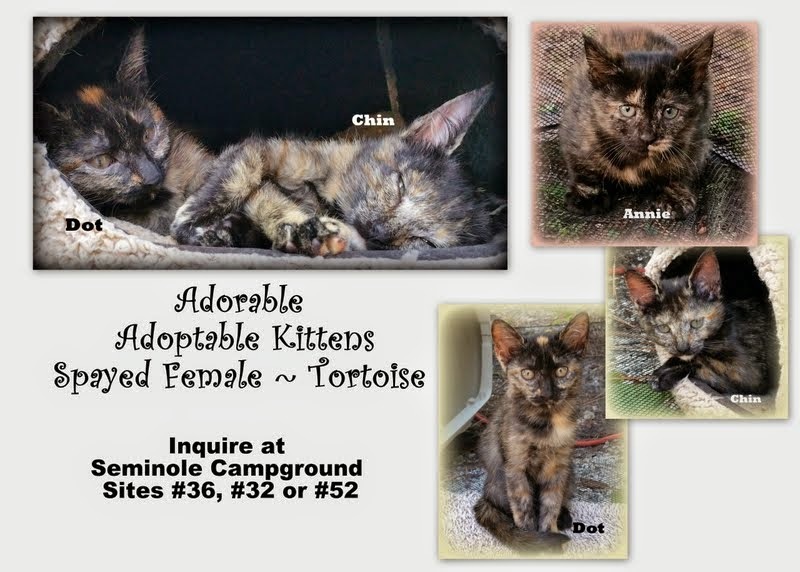 Tammi has been feeding the cat and now she's feeding the kittens but something must be done as they are all tortoise shell females and it's just a matter of time until the kittens begin to multiply. It's not a good situation. The campground's animals lovers ban together and spring into action. As our official Cat Rescue Queen, Linda assumes responsibility of the kittens if Tammi will capture them -- two at first. The third is quite wild and will take some special cat corralling by Tammi. Another of our group cat lovers, Joyce, along with Linda and yes, even Dale and I, become surrogate mothers to the first two kittens. They are appropriately named "Dot" and "Chin" -- you can figure out which is which and why. The kittens are kept inside Linda's "cat tent" and easily conquered once they've been tucked into the warmth of Dale's shirt a few times on the coolest mornings. The reluctant, but willing, cat comforter, Dale. Finally Tammi captured the third kitten but none of us was prepared for the fear this little girl felt. She hissed and spit and bit and scratched. The first few days we called her "Hissy" but quickly abandoned the name as it would certainly hamper her adoptability. After all, nobody wants to cuddle up to a mad cat. We tried out new names... let's see, Dot and Chin, and, and, an....Annie became her name. The week before Christmas, Linda was called to Ohio on a family matter and kitten care fell to Joyce and me. We were thrilled to take our daily "kitten therapy" but had to follow through with our leader's instruction to have the kittens spayed and made available for adoption. Socializing had worked out well for Dot and Chin but not so much for Annie, who got me with a deep bite puncture and some scratch as I tried to collect her one day when the campground lawnmower noise got too loud. I visited a local doctor for my tetanus shot. The "Cat House" is secure as Ozzie stands guard. Linda returned in January. Weeks went by as we contemplated what we'd do about the kittens. 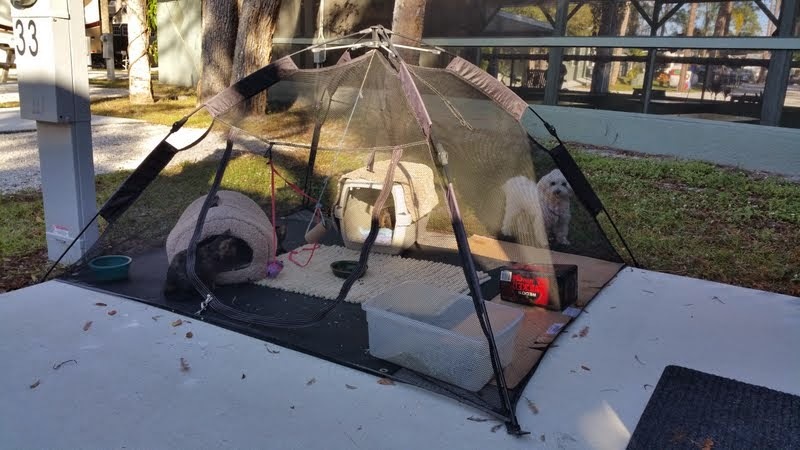 Seminole Campground is not overly accommodating to cats and was not eager to have them released, even in the storage area in the rear of the property. We made posters but we had very little interest in the wild kittens. Mary, Fran, Ernie and Pam came for an afternoon visit from West Palm Beach (where they're camping this month). 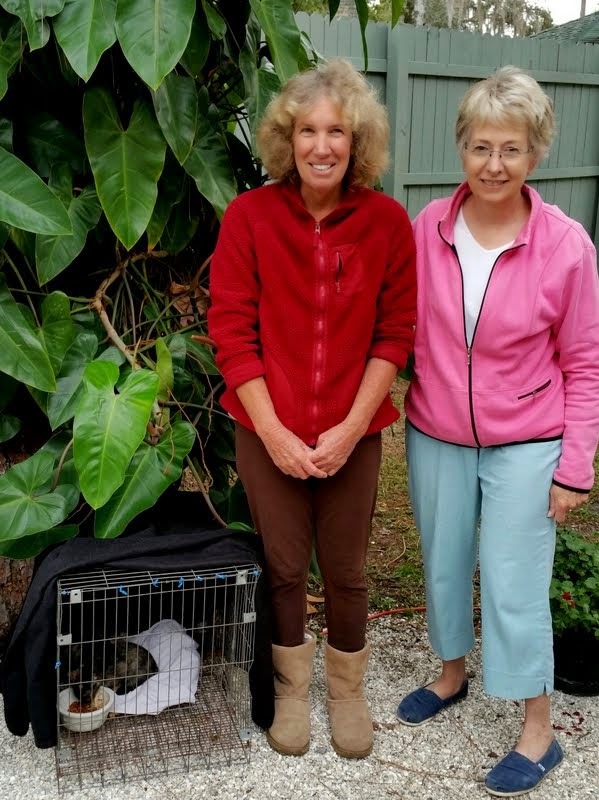 Joyce, Linda and I tried hard to convince Pam to take one of the kittens as a companion for the the rescued kitten she'd taken from here less than a year ago. No dice. Pam just wasn't smitten by the kittens. Our search for homes continued. 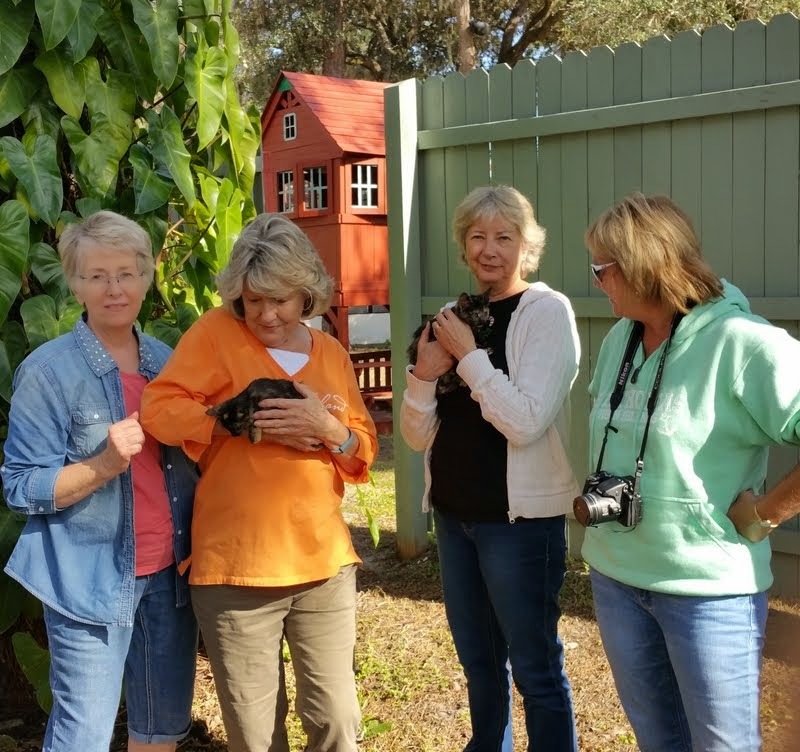 Linda, Joyce, holding Dot, Mary, holding Chin and Pam, not holding any kittens at all! Finally, we happened to see a young man on one of the close by horse farm properties. We asked about rehoming the kittens there. Fortunately, even though they had enough cats, these nice people asked among their horse farm friends and all three kittens were placed in a nice, big horse barn where they will live their lives virtually "people free" --- except for the good feeding and watering they will receive. "What happened", you may ask, "to the mother of the kittens?" Well, Momma kitty was also captured, socialized, neutered in the Lee County TNR Program and returned to the campground. Tammi and her boyfriend Rob, who live and work at the campground, call her their own. Another happy ending for homeless kitties. Awwww.